Back in 1996 my Wife and I went to Frontier Town, lots of things have changed over the past 19 years. I don’t remember them having a water park back in 96, it is a pretty expansive park complete with a miniature golf course. They also have a high rope park where you can climb and repel down zip lines all over the park, we did not try the high ropes but the people doing it looked like they were having a great time. We went there to see the Wild West Shows which is what we remembered many years ago before we had children. 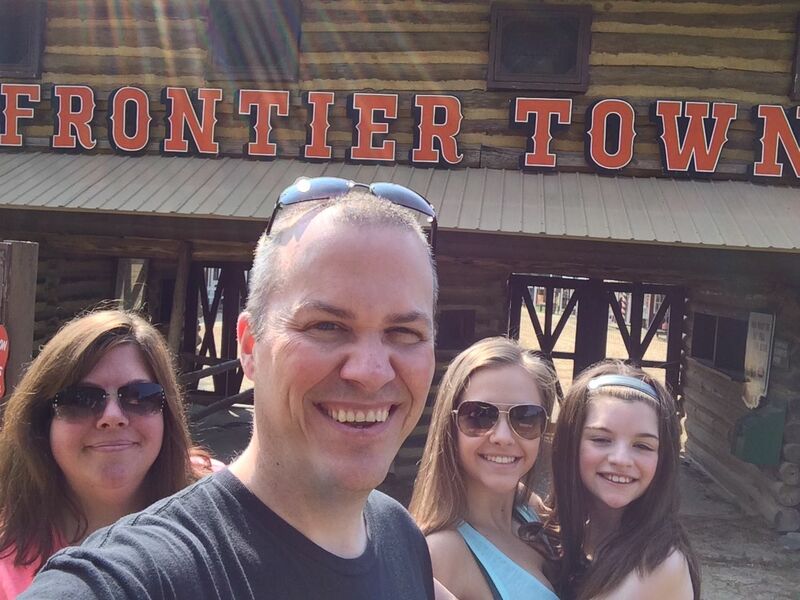 We go to Ocean City Maryland pretty much every year and we have never taken our Daughters so it was about time we took them and do a review of Frontier town. We were the first family to enter the park today and the people who work there are super friendly and very helpful. This is a picture of us before entering the park, ready to soak in all the Western goodness. The first thing they do at Frontier Town is have a good old fashioned flag raising, which was very nice and the whole crowd participated. Shortly after that a man who struck gold came into town in a covered wagon to make his large deposit at the bank. Well you probably can figure out what happened shortly after his arrival, yep an awesome bank robbery show complete with fights and gun fire and a few simulated deaths. Of course no one was hurt for real and it was a lot of fun for everyone. 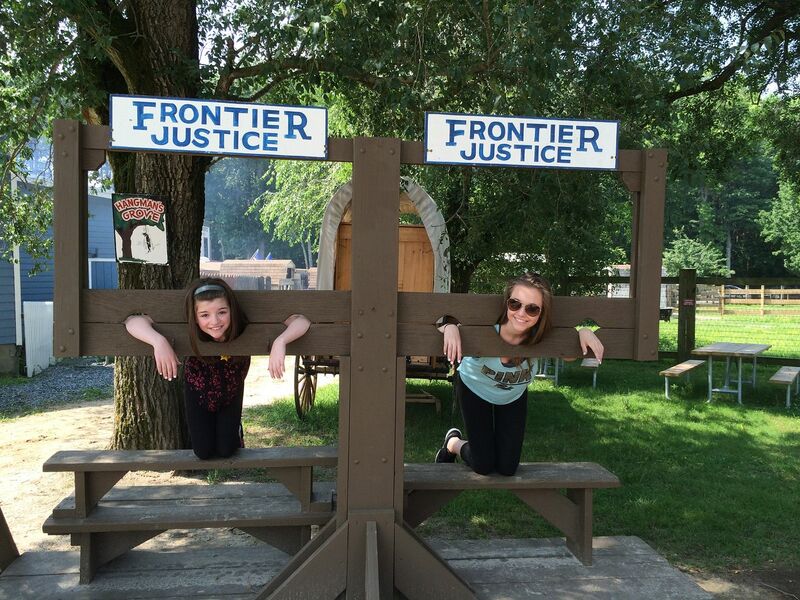 Here are my girls locked up a few minutes after the Frontier Town bank robbery show. 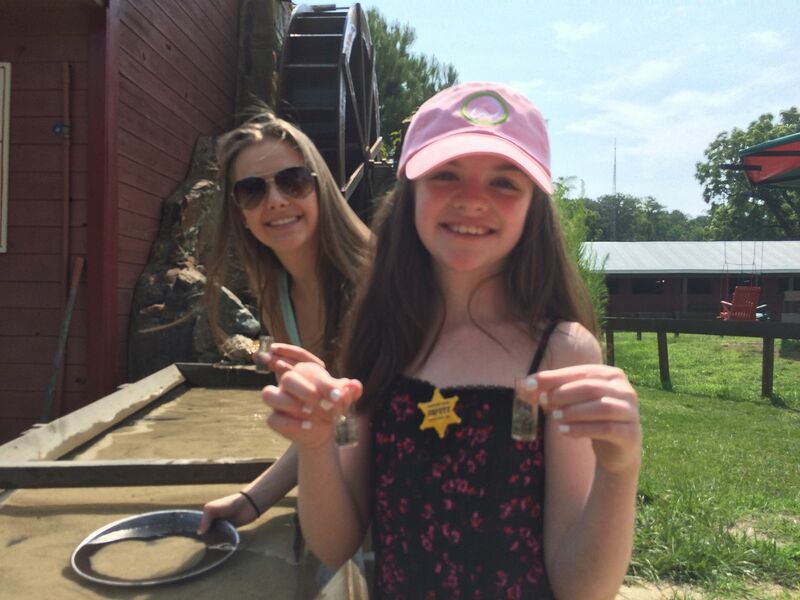 We also did some panning for gold, it is only an additional $1 per person and you get a great tutorial from an experienced gold miner. It was a lot of fun for all of us and you get to take home the gold you extract at the panning tables. They have plenty of small western theme stores to keep cool in on these super warm summer days, we spent a little time in the old time saloon and had a few snacks. It is pretty reasonable in my opinion for snacks and drinks within Frontier Town. They also have excellent western gear at very reasonable prices that are of high quality. Leather cowboy and cowgirl hats and very nice western boots at great prices. In this western show we seen this 7 year old boy Clay ride on two horses after his Dad did a pretty impressive display of precision horse riding, Clay certainly has an awesome teacher. Below is his picture on top of two horses. 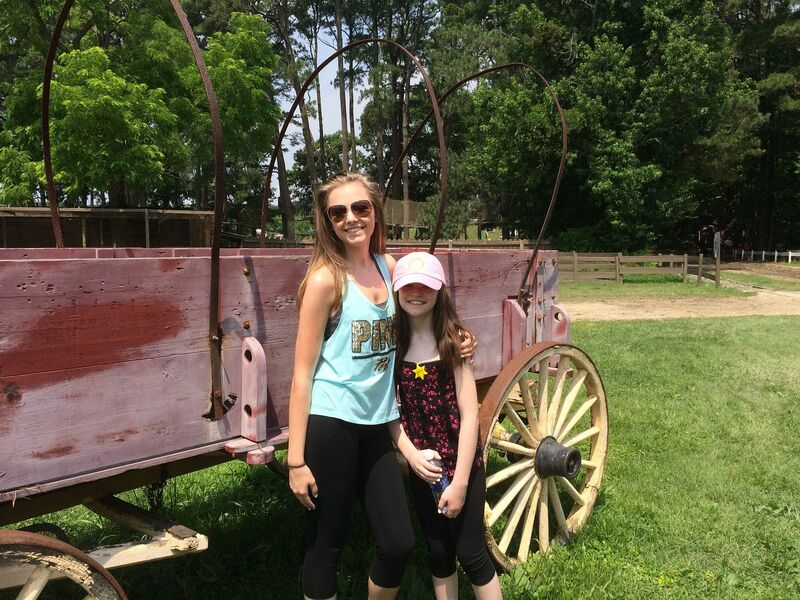 Frontier Town also has train rides, covered wagon rides and paddle boats to enjoy! 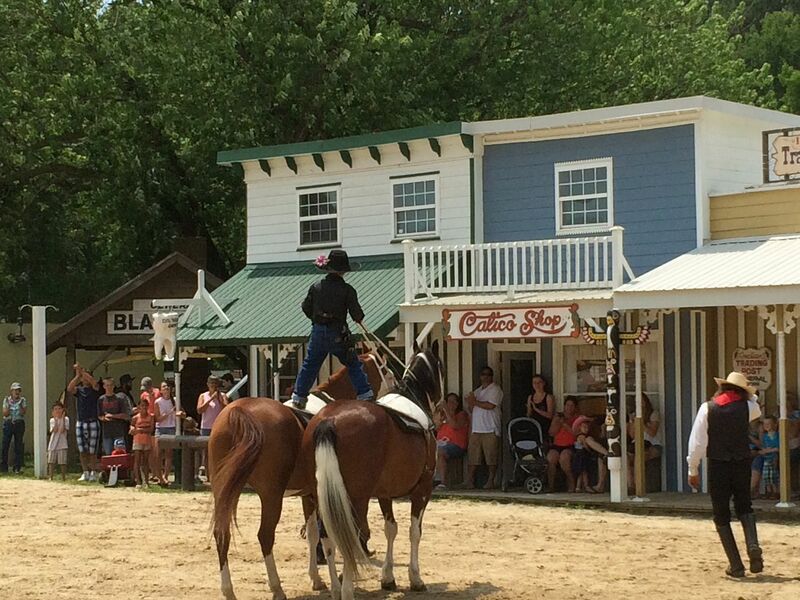 If you happen to be vacationing at Ocean City Maryland and have a free day definitely check out Frontier Town. Super family friendly park and if you camp you will have big discounts on admission to all the fun. Thanks for stopping by and checking out my post on Frontier Town Review at Ocean City Maryland. Looking to get healthy while you earn work with me personally here.